The birthday of my youngest son is looming. He'll be the grand old age of 9 and will be able to spend it with me. What does he want to do as a birthday treat? Go paintballing. With 7 buddies. He went this morning, as a taster, with the centre aéré and had a blast although also came back blasted with a nice big round bruise on his back from some little sod who fired at him too close. He's a bit of a warrior, my youngest; likes nothing more than donning his combat gear, WWI plastic helmet (that my brothers played with) and protective glasses (belonging to my eldest for science), stuffing a sarnie in his backpack, slinging a gun or two or three over his shoulder and, with walkie-talkie in hand, setting off on an adventure. This is one of the reasons why I love living where I do. It's safe enough for him to do that and me not worry myself silly. He's got an independent spirit which he can indulge without fear (within reason...). So we went to the paintball place this evening to check it out for birthday parties. They were just closing up so I was lucky to catch them. I could have called, but I rather hoped they'd have invitations already prepared like they do at the bowling place. Some hope, it was all rather low key commercially. The guy looked like he'd just walked off a bog having spent 3 weeks yomping through the rough with nothing but a mutt for company, living off the land without a rasor. The prices though were not low key at all. 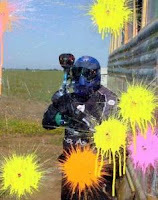 Living locally, we get a 'special price' of €18 for 150 paintballs per child. Yikes! My youngest wants to invite 7. M Scruffball suggested I ask parents of the little guests to participate financially. He said that's what usually happens with birthday parties as it is rather pricey. The going price is €10. To be honest, I was already reeling at the cost, and then, when I'd stopped reeling, I started all over again at the thought of asking parents for a financial participation. Although now I come to think of it, I do believe I've been asked for a contribution for one of my eldest's birthday buddy bashes. Is it shocking, as a parent, to be asked to contribute to another child's party? I could say 'no pressies' as a sop, to soften the blow a bit. Frankly, if I don't get a helping contribution, I'll have to reduce the size of the party to 4. I suppose it's worth a try. What do you think? Is it cheeky? Rude? Presumptious? Acceptable? And how much is reasonable? I paid €16 for him to go this morning en groupe. Would €10 be too much? This is all rather taxing for me, so your opinions on the subject would be gratefully received. What, like in the 1950s? Or when they were little? Gigi, I asked him if 'no pressies' was fine and he said it was. He'd rather be charging about having a fab time with his mates than collecting a bunch of stuff he doesn't need. Actually I feel a bit guilty re last year when he spent his birthday with his dad over the holidays and I didn't organise a party at all for him here cos he'd had a family one with his dad. I'll confess that I'm always relieved when a birthday party 'just' needs me to throw money at it (and a cake) rather than put myself through the cleaning and organising required for a more old fashioned style of party: they never live up to expectation and often end in tears (probably mine). Asking for a contribution rather than a present seems fair, and I bet the other parents will be glad not to need to think of one. Oh, hausfrau, I never thought of that and you're so right! I loathe having to go and buy a pressie for a kid I don't know with the limited shop options around here. Actually, yes, throwing money at it would be fine by me too! Well, I've decided on the No Pressie, Please Contribute line, and have made a stupendously fantastic invitation that I'm sure will wow my youngest and make him proud to have such a tip top mummy.